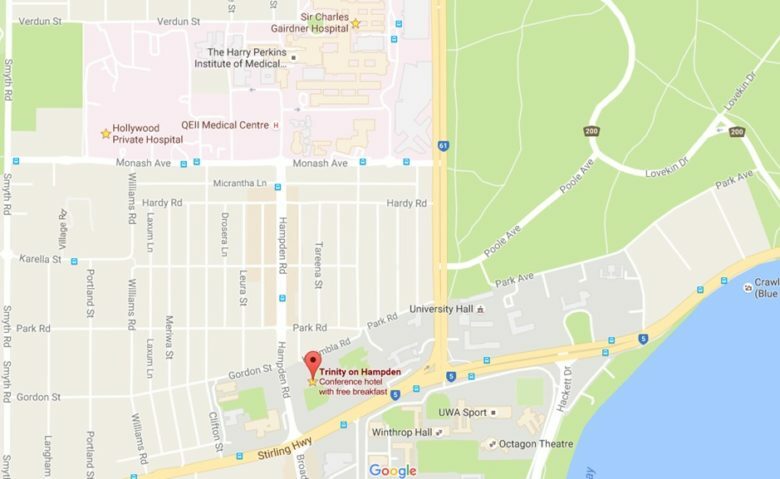 Trinity on Hampden provides the ideal choice for accommodation near Sir Charles Gairdner hospital, for outpatients, visitors and even locum doctors. Our self-contained accommodation has all the features to make your stay in Perth a comfortable one and is located only 800m from the hospital with complimentary onsite parking and public transport on your doorstep. For those requiring accommodation near Charles Gardner hospital, you’ll find convenience in staying at such a close location. Walk: Located within the QEII Medical Centre, Charles Gairdner is only an 800m, 10 minute walk from Trinity on Hampden. Drive and Park: Our free on-site parking is ideal for those driving into Perth to visit people in the hospital. If you wish to drive to the hospital, it will only take about 2 minutes and there are paid parking options available. Public Transport: Catch buses 24, 97, 103 or 950 from the bus stop directly in front of our accommodation, which will drop you at the hospital. The Perth’s Children’s hospital is due to open in 2017 and like Sir Charles Gairdner, is also located within the QEII Medical Centre. When the hospital opens, Trinity on Hampden is also conveniently located for those visiting patients or caring for children undergoing treatment in the hospital. If you’re looking for accommodation near Hollywood Hospital, you’ve come to the right place. Located only 1.1km from Hollywood hospital, our accommodation makes it very convenient to visit family or friends in hospital. Walk: An easy 1.1km walk along Hampden Road to the hospital will take you only 14 minutes. Drive and Park: Simply drive along Hampden Road and then turn left at the roundabout onto Monash Avenue. However, please note, there are very limited options for paid parking at Hollywood Hospital. We would suggest leaving your car at our free on-site parking instead and using alternative transport. Public Transport: Buses 24, 97, 103 or 950 will pick you up from the bus stop directly out the front of our accommodation. Simply hop off at the stop near Micrantha Lane and it’s a short 400m walk along Monash Avenue to the entrance on the hospital. To find out more about our accommodation near QEII Medical Centre and Hollywood Hospital, contact us on 9423 9423.